myHermes Price Increase Today Without Any Warning? Did anyone receive an email regarding the ridiculous price increases today as I haven't? Parcels weighing between 1-2kg are now 3.99 yesterday they were 2.79 ! Use p4d.co.uk or parel2go.com to shop around BUT DON'T BOOK THROUGH THEM until you have gone to the firms own website. Well last time I looked, it was in the details. Such as Parcel2go didn't give me any insurance but collect+ did. I know I can shop around but I can't believe they have changed prices without any notice! Parcelshops are more convenient than Post Offices. A tad late sending it AFTER you have changed the prices !! I would've expected a few pence here or there. But these changes have made myhermes worse value for money by a long shot. That small and medium weights was a kick to the nuts. Jeez that's a big jump up. Looks like they have scrapped the small and medium parcels. Oh well after moving from RM to Hermes and giving them nearly a thousand parcels to send , looks like I'll be going back to RM. RM will be pleased unless they follow suit. I didn't get an email either. If they do it will be April as that is when they usually do their changes. I think loads of people will switch back now if their parcels weigh over a kilo it's too expensive. I see its still the same small & medium lower prices on shutl, I havent tried to print anything though as nothing sold yet to try it out. Whatever you do, don't use Parcel2go without reading the reviews. Had a terrible problem with them and their customer service is none existant. Their CEO doesn't even bother to get one of his/her team to respond to complaints. 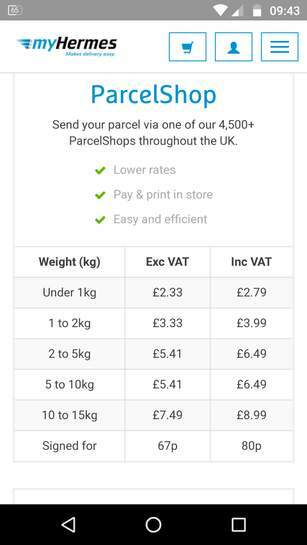 Unless they know something we don't(that RM) are increasing prices a lot soon then surely Hermes will lose a lot of customers,the staff in a Parcelshop we use told OH yesterday that a few customers they had who sent a lot through Hermes have gone back to RM due to this price increase.